Once TeleTracker Online imports the commission worksheet(s), it will be displayed like the window seen above. If the file contained more than 1 worksheet, each worksheet will be listed as a TAB below the grid window. Use the scrollbar at the bottom of the grid window to view the additional columns imported. 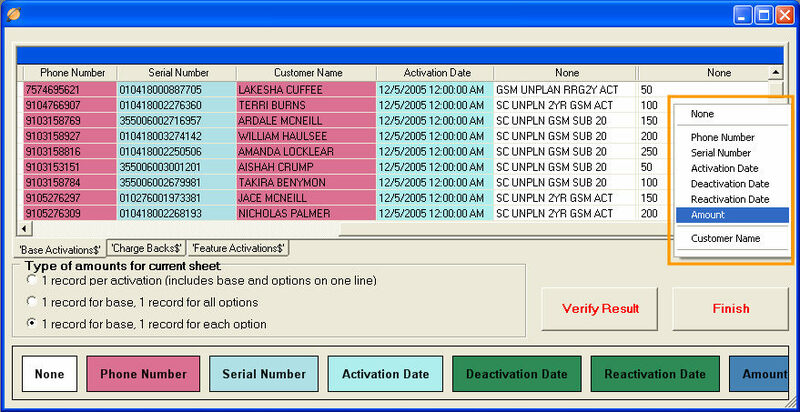 TeleTracker Online must know how to match the Service Provider Commission worksheet with your Activations within the database. Selecting the correct Type of Amounts will ensure proper reconciliation. This selection will depend on the specific configuration of your Service Provider commission worksheet(s). Click the following link for specific EXAMPLES. 1 Record per Activation (includes base and options on one line) : The Base Activation and any activated options are listed as a single line. The commission amount is a single amount including the base commission and any option commissions. The Auto Provider Reconciliation will take the different amounts associated with a single phone number and add them together for comparison. 1 Record for Base, 1 Record for All Options : The Base Activation is listed as it's own line item. All Options are listed as one line item, yet independent from the Base Activation. The Base Activation commission amount is listed separate from the Options commission amount. 1 Record for Base, 1 Record for Each Option : The Base Activation is listed as it's own line item. All activated Options are listed are listed as their own line item. Each one will have an individual commission amount. Take your mouse and RIGHT-CLICK on a column within the grid window. A list of column identifiers will be presented to you. Identify a column with the appropriate Column Identifier from the RIGHT-CLICK text menu. A RIGHT-CLICK menu can be seen above highlighted in orange. A MINIMUM of Amount and Phone Number must be selected in order to reconcile. 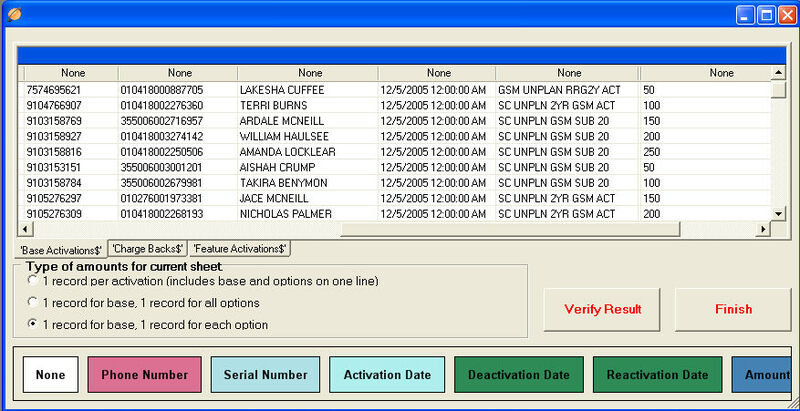 For more detailed and descriptive reconciliation records, identify additional columns using the RIGHT-CLICK text menu. As soon as you identify a column, a column color will be activated and the column header will be populated with the Column Identifier. Select the appropriate columns on each of the TABS imported from the commission worksheet. The Column Identifiers shown in the right-click text menu directly reflect the selections in the Column Selections window, Column Selections and Verification - Step 1.
button to verify the columns being compared for reconciliation. The results window will extract the identified columns and condense them into a single grid window. This window is for your reference, where you can see the columns and data that will be compared for reconciliation. When verification is complete, close the window.